If there was one book all women, in particular, should read, it’s this one by a former CIA Operations Officer, Street Smarts for Women. It contains chapter after chapter with information about situational awareness, reading people’s body language for danger, and a lot more. I’ve even recommended it to my teen son. 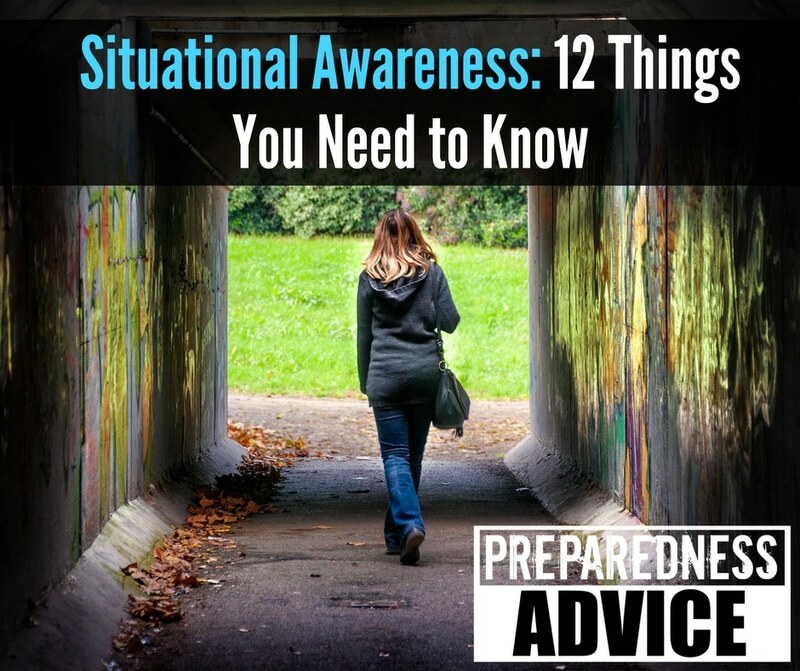 In my own life, I have used the following strategies to stay aware of the people and events around me. Basically, it is knowing what is occurring around you and using the information to avoid trouble. Never sit with your back to the door in public buildings. Make sure you have an unobstructed view of who is approaching you, preferable with your back to the wall. When walking down the city street, know who is behind you. You can often use the store windows to see behind you. Always watch your back. Don’t be obviously looking over your shoulder, but pay attention to somebody who is. That is unusual. Pay attention to anything out of the ordinary. Feel free to profile. It may not be kosher for the TSA or some law enforcement units, but as a citizen, if there are individuals who make you feel unsafe for any reason, quickly find a way out of the area. Don’t walk around looking at your cell phone. Some guy in southern California was so engrossed in his the other day that he walked off a cliff. It is not just people you pay attention to, it’s also objects that are out of place. Example: what about that strange backpack sitting on the street corner? Know what is normal in the area you are at. If anything or anyone seems out of place, take notice. Look for people who are acting pushy, authoritative, overbearing, uncomfortable or just out of place. Watch the hands. If people are armed with a gun or a knife, they will often pat the area to be sure it is still there. Don’t assume women are “safe”. These three sure weren’t. If you see a dangerous situation starting, don’t be afraid to walk away and call someone. When you are driving, pay attention to your rear and see if anyone is following you. Now this is very basic information and it sounds simple, but to get good at it you need to practice. Most people start out by trying to have their head on a swivel and end up attracting attention. Don’t be obvious. When you leave an area, talk to your wife or children and see what they noticed. You can make a game of this. Don’t look like you are paranoid, but at the same time, be a little paranoid. I intend to start paying more attention to what is going on around me; I suggest that you do the same. This entry was posted in security, self defense, survival and tagged situational awareness. Bookmark the permalink. Most important is to recognize that threats exist. Ignorance or denial, tuning out in a public place, make quick threat recognition and and avoidance impossible. Apathy, denial and complacency often are deadly. Individuals must take responsibility for their own security. Big Brother resources are scary, but the authorities cannot stop criminal action, but only respond. Therefore, people need to look out for themselves and their neighbors. Another important piece of mindset is learning to trust your “gut” or intuition. Often your subconscious will notice subtle danger signs that your conscious mind has difficulty reasoning. People who are victimized frequently experience vague feelings of danger prior to an incident, but ignore them. A threatening person not making an immediate move or who wanders off quickly after making eye contact does not mean there was no threat. In 1992, an American executive living in the Philippines was kidnapped by a Marxist gang in Manila. When debriefed following rescue, he described how kidnappers had blocked his car in traffic and abducted him. To the surprise of the debriefing team, he said that on the day before he was abducted, the same group of guys had attempted to kidnap him at the exact same location, at the very same time of day and driving the same vehicle. The attackers had failed to adequately box his car in, however, and his driver was able to pull around the blocking vehicle and proceed to the office. Since the executive did not consider himself to be a kidnapping target, he just assumed that the incident the day before his abduction was “just another close call in crazy Manila traffic.” Both the executive and driver had tuned out and the executive paid for his lack of situational awareness by having to withstand a traumatic kidnapping, and almost being killed in the Philippine National Police operation that rescued him. The objective of risk reduction training is not to cause panic but to raise awareness levels. Most parts of the world are safe to travel to, and with proper understanding of local conditions and some training, personal risk can be greatly diminished. I have started glancing up at rooftops and windows just in case a potential shooter is getting ready to go active. If someone was following me I would want them to know that I knew that they were behind me. Just curious about what your reasoning is for this. When you obviously are looking over your shoulder you will attract attention. Plus if someone is following me I don’t want them to know I am aware of them until I am in an area of my choosing. In other words surprise. Definitely trust your gut. One night long ago, along a very familiar roadside, I had a sudden feeling that something wasn’t quite right and decided to look behind me — only to see a vehicle well outside his lane heading straight at me at high speed. Another second or two and it would have been too late to get out of the way. I suspect the driver was drunk rather than homicidal, but either way I probably would have been dead. It wasn’t until the next day that I finally figured out what the tip-off was: the guy’s headlights were casting shadows in an abnormal pattern for that location. It took my logical mind hours to connect that subtle cue to the lethal threat, but only an instant for intuition to say “something’s wrong here”. I like the comment about knowing what is unusual for where you are. I try and match my vigilance with the situation. While a base level of caution is good, one need not exhaustive oneself unnecessarily if the environment is taken into account. And as far as not attracting attention, that’s just being classy. No need to alarm anyone by looking suspicious yourself. As an exercise to build situational awareness, each member of our group selects a three digit number as their digital focus (mine is 337, my name upside down). You then look for that number in your daily life, on a license tag, in a phone number etc. It’s amazing how quickly your subliminal mind will begin to pick up on your number when normally you would not pick it up. It really helps to improve awareness of your surroundings.